Welcome to the August issue. A lot of questions from the Midway movie group has kept me busy. They certainly want to get all the details right. They asked me to not post any of their question on the RoundTable and I had to sign an NDA so I can' really say much of anything. Unfortunate but I understand they want to avoid any leaks on the script. So unlike the first time they contacted me I can no longer post anything on the RoundTable pertaining to the movie. But I have all the emails and after the movie is out I am free to publish the correspondence if it is something we care to discuss in more detail. So with that in mind we do have some answers to questions from last month and some new questions. We also have a nice 4 part report on the aircraft on Midway during the battle, the obit for Bill Howard and more. My father, Carl Hickman, was a Marine on Midway Island during the Japanese attack. He was a Marine SBD radioman/gunner? (rear gunner) flying with pilot Robert Vaupel. I have an after action report somewhere here that indicates their airplane would not start (flooded? ), my father removed the .30 cal machine gun from the rear of the airplane and fired at attacking aircraft from a foxhole or sandbagged location. Sorry about my lack of correct terminology. I suppose that you can add at least that one aircraft to your list of planes on the ground during the attack. Thank you for your time and effort to remember these men that served during this time of war. All were general purpose bombs. The 100-lb bomb was most likely used to suppress anti-aircraft fire and/or to destroy aircraft remaining on the flight deck. It would have caused negligible damage to the carrier itself. By 1944, the use of the 100-lb GP bomb, according to the “Selection of Bombs and Fuzes to be Used Against Various Targets” published by the CNO, was limited to land targets including: industrial structures, oil and gasoline tanks, ammunition dumps, airfields and tanks. 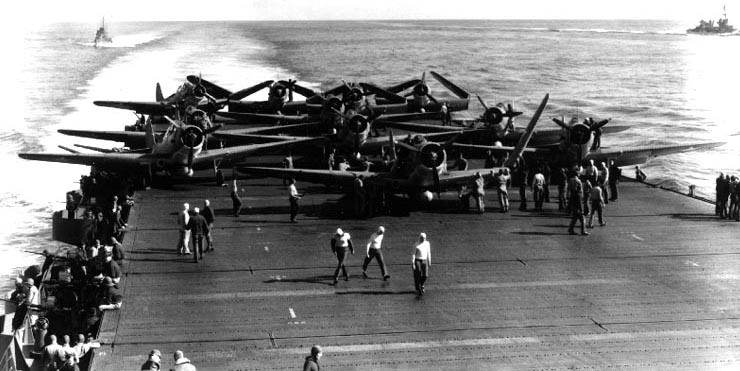 Editors Note: VB-5 aka VS-5 did not attack the Japanese carriers that morning. 10 (not 7) were sent to look for the Japanese carrier or carriers that were unaccounted for from the PBY's reports. At the time they were launched the aircraft from the morning strikes were not back yet so Fletcher did not have any reports on how many carriers were hit. They were all armed with 1000 lb bombs but none got in attack position when they spotted the Hiryu. Upon reading the note from Martin Bunch in the July Roundtable, I thought I’d forward these 4 pages from the Tom Doll paperwork. They may be of slight help in reconstructing your answer to him with respect to the events of 4 June. At the very least, please save these scans and add them, as you see fit, to what I will be sending you in the future. Editors Note: I converted the images to a pdf so those that like to download it and read them can do so easily. Clicking on the link should open them in Adobe Reader. You can save them from there. I do not recall if I sent you a link to Bill Howard's Obituary. Like all of you, he was an extrordinary man. We miss the heck out of him. God Bless and guide all of you. This dear friend is one of the millions of our wonderful military. He was on the USS Yorktown, CV5, when she was sunk during the Battle of Midway in WWII in June 1942. He was a retired Captain in the United States Navy. Editors Note: Yes you sent me a copy on the 12th as well. Thanks for all you do for the BOMRT. I’m sure it takes a lot of time to reply to emails, follow-up on questions/requests and create the newsletters. I look forward to each issue and enjoy hearing from the many contributors. I have a question and I haven’t come across it in the Roundtable so I’m hoping you might know. Is there any Japanese footage from the BOM? I know that John Ford was on Midway and there is some excellent color footage that he shot. I haven’t seen anything from the Japanese side though. Editors Note: I'm not aware of any footage from the Japanese side that survived. There were several photographers taking pictures as well as film on the carriers. However the only pictures that survived from the Japanese side were those of the Hiryu on June 5th shot from the Hosho recon plane, and a picture of Hiryu launching one of the strikes on Yorktown. The only film I know of that got off the Akagi was a Navy photographer that was filming the attack on the Kaga. From what I remember he got off the ship with the film but it disappeared later possibly lost in the water before he was rescued. Any film or pictures that any of the surviving crew or for that matter from other ships as well were confiscated and destroyed so that was probably the fate for that film clip as well. The picture of the Hiryu launching a strike against the Yorktown was certainly taken by a crewman who did not relinquish his camera or film after the battle and the film was probably developed after the war. I thought that might be the case. Thanks for your quick reply. Radio receivers (commercial stations) at Midway circa 1942? I'm hopeful someone on the roundtable can help. I'm a Montana-based author, currently working on a book that will bring readers the life story of a fellow Montanan, B-26 pilot Jim Muri. To make a more compelling story, I'm trying to describe what it was like for fliers and others sent to Midway just before the June 1942 battle. It seems unlikely to me, although I'd love to be proven wrong, that servicemen had access to battery-powered radios that could pull in broadcasts of popular music at the time. Envision the guys catching snatches of Glenn Miller's big band while they awaited orders. Is there anyone who can confirm my hunch that radios were not readily available, probably not available at all to the Army, Navy and Marine folks at Midway in May and June 1942? Or tell me I'm wrong, that a few radios indeed were there and could be listened to, if a person knew where to look? Editors Note: I'm not aware of any battery operated personal radios on Midway before the battle. However there were several radios that would bring in radio stations from Hawaii that were listened to although I'm not sure how many or where they were exactly. I'll see if I can find out for you. I am doing a Power Point presentation for Planes of Fame Air Museum on 6 october . I need a photo of Commander Stanhope Ring, CO of Air Wing 8 on 4 June. I have not had any on the internet even though Ring made Admiral and was given the Navy Cross. Do you have any image that I can use? Editors Note: Mr. Carlson, I don't have one handy but this is a link that I find useful from time to time when looking for particular men. Here is a direct link to Ring's page. Hello my name is Steve Adamson and my great uncle Harold Jennings was onboard USS Yorktown and survived. He told me he floated on his pants until rescued, I believe he was a gunner and or in aviation, just wanting to see if you can provide any information on him. His name is on the list. He was Aviation Mechanics Mate 3rd Class in division V-1 on Yorktown. I'm not sure what V-1 stands for. I'll try and find more about this for you. Maybe someone more familiar with this designation can help. Thank you very much! He and I spoke a little when I came home from my Navy Gulf deployment in 1988 escorting oil tankers, he loved that I was in the Navy and told me a couple stories and just now in my life I'm wanting to learn more. And hes passed on so maybe a bit difficult. Thank you! !